The new Ghost Hunting apps are fast becoming the newest thing. 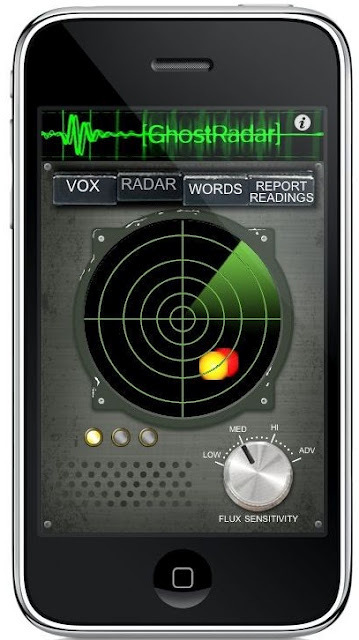 Many of the Smart phone now have several versions of this new paranormal tool. If this is something you are interested in, check with your app provider for more information on each app and all of the specialties they provide. 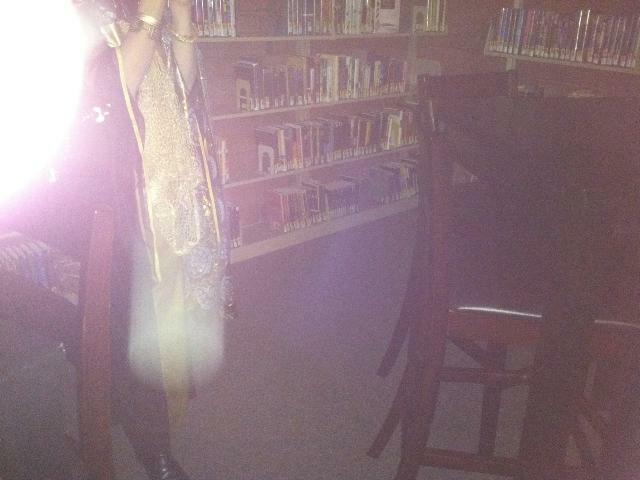 During last years Ghost Walks several participants used their Smart phones and the new apps to capture evidence while in the library. The following was submitted by Bobbi Justice a library patron. She currently uses an ITouch with a Ghost Hunter M2 app. I have an ITouch that has an application on it called Ghost Hunter M2. I have had several experiences at the library. One of my first experiences was when I was walking toward the restroom, I walked past the staircase and saw a man standing at the top of the stairs and could tell he was very angry with the people that were there. I had gone into the restroom by myself. The restroom was empty. While I was in the stall I heard a little girl outside of the stall. I asked if someone was there and received no answer. I left the stall and after washing my hands, I was guided into the end stall. I couldn’t see all of the little girl but I did see her dress which was older in fashion. She held my hand and asked me to help her. This occurred during the first week of October. I used my itouch and just old the people there that if they had something to say they could speak into my hand and I would see what they would to say. All of these responses were on the main floor of the library while we were looking for books to bring home. Time: 20:39:38 wilderness, 20:39:49 Friday, 20:40:23 warm, 20:41:52 east, 20:42:41 decide, 20:45:47 accident, 20:46:44 start, 20:47:08 solve, 20:47:08 solve, 20:47:44 cross, 20:48:58 guide. 20:53:42 comfort, 20:54:49 city, 20:57:10 student, 20:57:51 company, 20:58:50 admit, 20:59:26 patch, 20:59:42 girl, 21:00:13 Allison. Time: 15:49:13 show, 15:49:19 Lamar, 15:49:26 bank, 15:50:26 work, 15:52:02 robin, 15:56:24 crook, 16:00:27 agree, 16:02:16 chill, 16:02:20 return, 16:03:01 mark, 16:03:03 taste, 16:04:55 Dennis, 16:05:05 furious, 16:05:30 north, 16:06:15 Michael, 16:06:27 write, 16:06:27 hear, 16:08:29 pencil, 16:09:17 examine, 16:09:45 night, 16:10:55 Beyoncé, 16:11:20 search, 16:12:07 restaurant, 16:12:11 family room, 16:14:01 quiet, 16:15:16 motorcycle, 16:15:38 everybody, 16:16:15 cracker, 16:17:17 ladybug, 16:17:31 airport, 16:17:46 sugar, 16:18:08 Tina, 16:18:41 dating, 16:19:15 skirt, 16:19:20 education, 16:20:11 mask, 16:20:53 drop, 16:21:44 friend, 16:23:10 eat, 16:23:49 increase, 16:24:10 goose bump, 16:24:53 dust, 16:25:52 clover, 16:26:19 Kim, 16:27:02 Reynold, 16:27:25 device, 16:29:14 doubtful, 16:29:43 distract, 16:29:47 chubby, 16:30:08 reveal, 16:30:27 frame, 16:30:34 Bob, 16:32:07 may, 16:32:40 point, 16:33:28 pizza, 16:33:30 Jesse, 16:35:14 icicle, 16:35:57 thirsty, 16:36:24 cook, 16:36:26 Melvyn, 16:38:58 hers, 16:39:22 Arlan, 16:39:48 african, 16:40:07 clean, 16:40:17 Everett, 16:41:13 live, 16:41:33 build, 16:41:39 your, 16:42:30 goldfish. Time: 15:22:30 remember, 15:22:50 Janice, 15:23:33 dock, 15:25:33 kitchen, 15:25:56 skeleton, 15:26:10 heater, 15:27:41 guests, 15:29:49 Malinda, 15:30:19 cellar, 15:30:54 Avis, 15:32:30 get, 15:36:17 odor, 15:36:29 belly, 15:36:30 William, 15:37:07 Annie, 15:37:55 try, 15:38:43 raining, 15:38:52 yours, 15:38:54 fart, 15:40:12 sports, 15:41:12 Marina, 15:43:10 city, 15:44:22 perfume, 15:44:29 mail, 15:44:30 darkness, 15:45:30 livingroom, 15:46:33 monk, 15:49:07 stress, 15:50:07 deal, 15:51:33 scary, 15:52:03 Lynnette, 15:53:29 cook, 15:54:11 right, 15:56:22 scared, 15:56:24 jealous, 15:56:46 drowned, 15:57:14 talkative, 15:57:50 spoon, 15:58:00 livingroom, 15:58:04 boss, 15:58:05 Raymond, 15:59:01 repair, 15:59:17 Helen, 15:59:40 doll, 16:00:48 fill, 16:01:15 threaten, 16:01:23 come, 16:01:53 choice, 16:02:28 grandparent, 16:03:09 always, 16:03:57 noon, 16:04:04 shave, 16:05:11 student, 16:05:15 intruder, 16:06:00 mad, 16:06:26 purse, 16:08:54 smell, 16:10:20 beautiful, 16:10:33 forget, 16:10:43 injection, 16:11:10 pillow, 16:11:13 warn, 16:11:23 Earnest, 16:13:05 struck, 16:13:41 end. 19:52:53 directions, 19:53:04 rock, 19:53:13 tank. 18:17:30 kissing, 18:17:43 orb, 18:17:52 beetle, 18:18:16 booger, 18:18:57 sneeze, 18:20:03 count, 18:20:54 Iona, 18:21:40 friendship, 18:21:46 buy, 18:22:22 inform, 18:22:25 homework, 18:22:52 scary, 18:23:00 Lily, 18:24:25 Marianne, 18:24:38 flame, 18:24:40 air, 18:24:55 makeup, 18:24:57 lettuce, 18:25:45 may, 18:25:56 lunch, 18:27:18 women, 18:28:58 understand, 18:29:26 link, 18:29:36 income, 18:30:37 toothpaste, 18:41:43 Russell, 18:43:37 her, 18:43:42 phone, 18:45:20 mother, 18:50:38 Wednesday, 18:50:42 mouthwash, 18:51:26 homework, 18:51:28 demand, 18:52:01 involve, 18:52:11 escape, 18:53:01 taxes, 18:54:20 hunter, 18:54:50 thief, 18:55:02 elderly, 18:55:43 Nevada, 18:57:05 beard, 18:57:08 eating,18:57:11 dead, 18:57:14 burp, 18:57:55 protect, 18:57:59 read, 19:26:57 patch, 19:27:55 purple, 19:29:54 early, 19:32:55 Brenda, 19:34:26 possibly, 19:35:17 winter, 19:36:55 hate, 19:37:18 Jake, 19:39:37 snacking, 19:40:24 head, 19:41:13 toilet paper, 19:41:43 distance, 19:43:10 far, 19:43:20 Alaska, 19:44:02 early, 19:44:22 clean, 19:47:19 pillow, 19:48:39 illness, 19:48:42 Friday, 19:48:57 prophet, 19:51:16 calling, 19:51:38 Jeffery. 19:50:43 tongue, 19:52;50 pot, 19:54:02 contribute, 19:54:23 earth, 19:55:45 Iran, 19:56:08 airplane, 19:56;20 contact, 19:57:10 pull, 19:58:16 circle, 20:00:19 pushed, 20:01:47 math, 20:02:18 make, 20:03:24 clock,20:04:25 put, 20:05:36 take, 20:07:06 cook, 20:08:15 steel, 20:08:21 Newell, 20:09:43 ship, 20:10:54 mitten, 20:12:01 clear, 20:12:27 you, 20:13:43 Chile, 20:14:25 focus, 20:14:32 keep, 20:22:27 absolutely, 20:23:39 move, 20:23:54 Bart, 20:26:14 money, 20:27:40 outside, 20:28:36 Sophia, 20:29:56 Bert, 20:30:33 pear, 20:32:55 claim, 20:34:18 change, 20:38:36 perform, 20:41:01 loud, 20:42:00 Oregon, 20:42:22 haunted, 20:42:41 Zelda, 20:48:18 Paul, 20:48:27 liquid, 20:50:06 April, 20:50:47 sister, 20:52:55 Osama, 20:53:12 plan, 20:54:38 toys. During our tour I had several experiences. When we first started the tour we went into the restroom first. I was one of the last people into the restroom. I asked if anyone was here. The two women who were beside me heard me and then saw the response. The response that I received was Newell then through the ghost box the name Newell was heard. I felt him and I felt the little girl in the room. She was feeling a little overwhelmed with all of the people in her space. After everyone left she led me into the end stall and asked me to help her again. When I was guided into the stall there were other people there. They saw me talking to her. They could feel her as well. Then we left and started to go through the main level of the library. We were on the children side. I could hear people talking, people who were not on the tour with us. We walked toward the big tree and I could smell cigar smoke. The smell was thick and overwhelming. As we walked toward the Young Adult area I could feel someone walking behind us, it felt like a man who was not happy with us being in “his place”. I was at the tail end of the tour and felt a lot of people behind me, people that were not a part of the tour. We went into the young adult area and in the corner I saw a man with a tall hat and could tell he was not happy we were there. We then went to office right behind the counter. In the corner by the copier there were two dark figures. I could see them and the room had a peculiar smell. As Ellie was telling the group about some of the things that had happened in this area, the dark figures left. We went back to the garage but I felt nothing there. As we went up the back staircase the feeling that I got was that we were not welcome there. It was stifling. My breathing was burdened and it was extremely hot. I felt like something was pushing down on me. We talked about the stairwell and things that had occurred there. 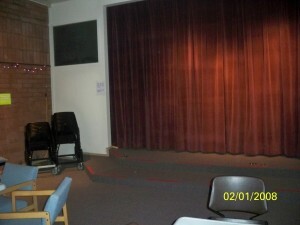 We went into the lounge and had things occur there. I went around by the sink and someone was in the corner watching us. I didn’t get a sense of who it was but it was someone. As we were leaving the tour we were walking down the hallway, I felt like we were being herded out of the area. It was like someone was pushing us out of there. As we were walking toward the top of the stairs, I could not walk past a certain spot because a man was standing at the top of the stairs and didn’t want to let me pass. He was very angry that I was there but didn’t want to let me leave. As I got to the top of the stairs he started to push me down the stairs. Now each time I walk past those stairs I can see him, he has a lot of malice to those who he does not welcome in that place. The little girl in the bathroom is there and asks for help but I don’t know how to help her. I like being at the library. I’m not afraid of it and respect all that are there, even the man that hates me. 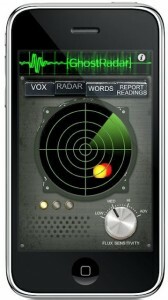 If you use an ITouch and are interested in the paranormal there are several apps available. Check with your app store. If you do try the new apps and are in the library please share your information. Ghosts at the Stanley Hotel in Estes Park, Colorado. For more information stop the the library or call 307-875-3615. 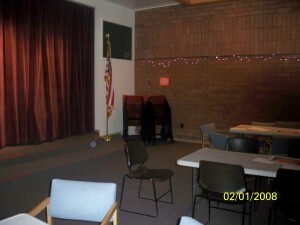 Be sure to stop by the Sweetwater County Library to buy your May 5th Ghost Walk tickets. Tickets are $5.00 each. The 9:30 pm & 11pm are now full. Other times are still available. For more information please call 307-875-3615. Several photos have been turned in by various means phone, email, and hardcopy. I would like to attempt to post these for your viewing. Because the photos have been taken by several different types of media, these may come across as dark. To view them better, click on the photo and most computers will then allow you to enlarge the item so that you may view it clearer. 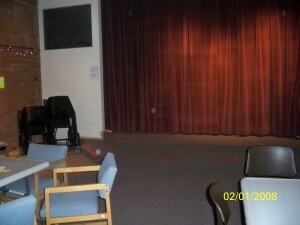 Photo #1 is of a greenish apparition with one possible hand visible. 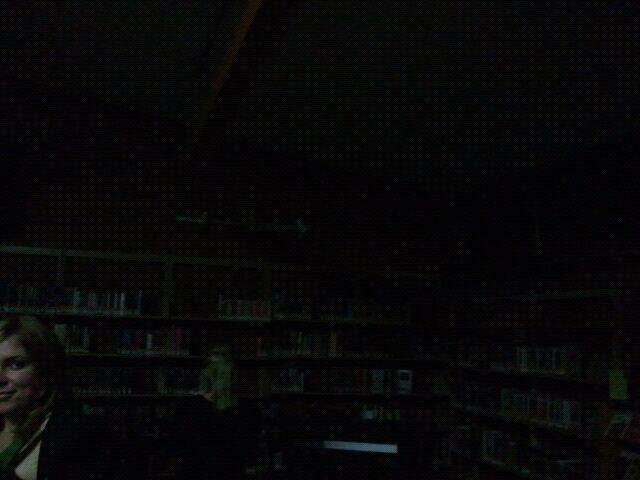 It has been suggested that this was a spirit trying to slip between the stacks. No one noticed it at the time, but there definitely seems to be something there. Photo #2 is the same photo cropped to better show the greenish figure. Notice staff member Amber in the lower right corner. No one noticed this apparition at the time. Photo #3 is a closer cropping of the original photo to try to show even more detail. Photo #4 is a photo sent in by Whitney which shows a large white-like shape. After asking Jenny from PI Team of Utah and John of UROPA to review the evidence for me, they both said it was camera flare. The orb photos were sent in by William Aprill. Please take a look and see what you see. Disregard his date on the photos, it is incorrect. My general feeling is that these are dust not ghosts/spirits. Please let me know if you see something I do not.